Kenny Salvini tells of the time he sat in a circle of seven quadriplegics and how it was a pivotal moment in his recovery journey. This moment of these seven sharing their raw, personal experiences with one another, sparking a desire in Kenny to begin the transition from being trapped in the despair that a spinal cord injury can bring to regaining the ability to live life. Kenny says he has always been in motion; he loves to move and shares that he is a bit on the ADHD side. Kenny describes a time in his childhood when his mom was shocked that his kindergarten teacher expressed that Kenny was sitting in a chair. Kenny’s teacher wanted to brainstorm ideas of how to compel Kenny to sit still and focus more. But Kenny’s mom was just overjoyed that Kenny was actually sitting. With Kenny’s need to always be on the move comes the characteristic of being an adrenaline junky as well. He competed on both his high school and college wrestling teams, he enjoyed flipping while wakeboarding and was an avid skier. February 11, 2018, marked Kenny’s 14th year anniversary of living with a spinal cord injury. Kenny shares how he continues to marvel at how far he has come since the day his life flipped upside down. On that day, that day that seemed just like a typical day, Kenny sought out to quench his thirst for that adrenaline rush he loved so much. But, the stark contrast of how that rush of adrenaline came to a screeching halt when Kenny came crashing down created the sting of irony; Kenny went from constantly moving to not being able to move at all. In an instant, Kenny entered the world of being a quadriplegic. Ten years would pass before Kenny ventured back up the slopes to find that icy spray-filled adrenaline rush that he had once loved so much. 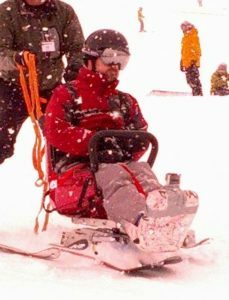 Skiing had been a sport that was enjoyed by Kenny’s entire family; but, following his accident, he nor any of his family members continued to ski. That was until his 11-year-old niece took up skiing lessons for the first time. Kenny found himself up on the mountain once again, ready to face some demons. Even though skiing now took some extra effort and looked a little different than before, the ride was cathartic all the same! Kenny’s niece may have been the tipping point to encourage Kenny to trek back up the mountain to ski once again. But, there had been a long, bumpy and winding road that had led up to that point. This road was filled with many people who had traveled the highs and lows right by his side. Kenny expresses that he has been really lucky throughout his spinal cord injury journey. He says he is truly blessed by all the support he has received and explains that it is not an exaggeration when he voices that it takes a tribe to keep a quad alive. For the first six years of Kenny’s journey as a quad, he describes himself as a shut-in. His new world was confined to the block radius around his home. For many months, he would not even leave his house let alone his bedroom. However, Kenny’s mindset changed when enlightenment came in the form of an angel; this angel, a nurse who had assisted him through rehab after his accident, just happened to wander back into his life; she plucked him up out of the despair that had enveloped him, and in a two-year, whirlwind relationship, taught him how to “Do Life”. At one point, this rehab nurse hauled Kenny to a Kiwanis meeting; it was at this random meeting that Dan McConnell, a quad of 40 years, entered Kenny’s life. Dan rolled right up to Kenny and introduced himself. From that moment, Kenny had the need to meet everyone in a chair. After fourteen years, Kenny continues to have the desire to meet anyone and everyone like him, newly injured, quad veterans and those somewhere in between. He loves for people in similar situations to find each other, to sit knee to knee, share their story, learn from each other and together travel the pathway of healing. There is a depth of empathy that comes with the acquisition of a spinal cord injury and Kenny describes his story as a list of people who have come alongside him in his journey; his parents, his sister, his rehab angel, Claire, Dan, Todd, Jesse, Ian, and many more. One story Kenny shares about his journey is that of his “long-haired, hippy-friend” (as Kenny affectionately calls him), Ian MacKay. Ian told Kenny he was an idiot for not using an adaptive mouse. And after Kenny used the mouse for the first time, he agreed with his friend. Sometimes it is necessary to get a blunt motivational push from a close friend in order to make changes that are for the better. This is a positive reinforcement of relationships with people who experience similar situations. As Kenny continued to meet people and personally grow in his own journey, he realized that the necessary component of networking was missing. HIPPA, in its desire to protect people’s privacy, had actually created a vacuum that kept quads living in solitude. A fellow quad could live mere miles away from another quad and not have an inkling that support and understanding is right around the corner. There needs to be a balance between privacy protection that HIPPA provides and being able to connect those in similar situations in order to prevent isolation. This is where The Here and Now Project, a support network for people with paralysis, comes into play. “When people who understand each other gather together, sparks fly”; out of this idea, that Kenny came to value so much, morphed The Here and Now project. The beginning implementations of this project were sparked in 2014 at the Spinal Cord Injury Association of Washington Walk & Roll. However, at that time, Kenny had no idea what the Here and Now Project would look like or eventually become. The project was eventually built up out of two different models. That of various spiritual recovery groups exemplified by and instilled in him thanks to the relationship he had with his rehab angel and Ihadcancer.com’s inspiration that we all need to live for today. Today, The Here and Now Project consists of meetup groups that convene monthly and once annually where all the monthly groups meet together. These groups are found all over Washington State and are different sizes, but they have the same underlying theme of focusing on supporting one another. When someone acquires a spinal cord injury, all lives around that person are impacted and every single person needs community support. Thus, the building of The Here and Now Project did not stop with those with paralysis but went on to focus on providing support for family members, caregivers and supporters as well. People have played an extensive role in the building blocks of Kenny’s paralysis story. However, another means of healing, that Kenny has utilized throughout his journey, has been writing. Shortly after Kenny returned home from the hospital, he started his blog. Out of his blog sprung the “Help Center”. Back in 2005, when MSN messaging was the hot way to communicate, and My Space was the go-to media platform, Kenny’s blog blossomed into one of the “Best of Spaces” by msn.com. In one day, his blog had a half a million hits alone. He received an overwhelming amount of responses as well as crazy offers for all kinds of things. Years later, Kenny found out that he was a “matchmaker” as a couple that met via his blog had gotten married. It is all about the ripple effect, your actions affect everyone around you. On the flip side, internet trolls affected Kenny. Kenny had become a public enemy due to a lawsuit in which he partook. These internet trolls soured his experience of writing. 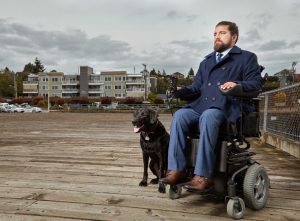 Kenny decided to take a break from sharing his story in the form of the written word until New Mobility, an accessibility magazine, approached him with a platform of a semiregular writing gig. He once again took to his blog to share his “Do Life” experiences. In a recent blog post, Kenny shared about flying beyond his comfort zone when he traveled via plane for the first time following his accident. He had heard of the systematic problem with airlines breaking wheelchairs, so for many years, he avoided flying altogether. On his very first flight as a quad, American Airlines destroyed his power wheelchair. His mobility device that allows him to do life was no longer functional. After months, Kenny finally received a new working chair. A year later he returned home from a trip to D.C. to find himself again without a working power chair. This time, Alaska Airlines was the culprit to his chair’s demise. Alaska has been more responsive, than American Airlines, to solve this systemic problem of damaging chairs. United Spinal has been assisting with the proposition to update airline legislation to better the travel experience for people who travel with wheelchairs. Kenny is hoping that his unfortunate experiences of losing two power wheelchairs, as a result of airline negligence, will be the catalyst in bettering air travel for all who use wheelchairs. On his blog, Kenny describes himself as “A typical man, atypical situation.” This portrays him so well as even though he is a quad, that is only one characteristic of who Kenny Salvini is. Kenny says we just need to find that common thread that will promote acceptance of one another. He acknowledges that everyone will become disabled to some extent at some point in their life, but a little forethought can go a long way. If people can also acknowledge that anyone can become disabled at any time, society will be more willing to plan ahead and make our world more accessible for and more accepting of all. Living life after a spinal cord injury can be difficult to execute. However, Kenny believes that life does and should not have to stop after an injury. He emphasizes this focus will keep us from missing out on life, that we should not live life in fear but instead just “Do Life”.